Ellen Heaton (1816–1894) was a philanthropist and art collector in Leeds, best known for her patronage of and friendships with members and associates of the Pre-Raphaelite Brotherhood and the influential art critic John Ruskin. 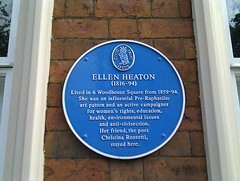 Ellen Heaton (1816-94) lived in 6 Woodhouse Square from 1859-94. She was an influential Pre-Raphaelite art patron and an active campaigner for women's rights, education, health, environmental issues and anti-vivisection. Her friend, the poet Christina Rossetti, stayed here.